HWC is a friendly informal club with approximately 150 memberships of all ages from young children, families, to pensioners who really ought to know better ! The Club is situated at Hickling Broad, the largest and most northerly of the Norfolk Broads (see here). Our private beach, grassed rigging area and car park are situated next to the Parish Staithe and near to the Pleasure Boat Inn. 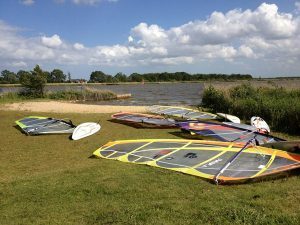 The Broads location, in open countryside, and near to the North Sea coast make it one of the UK’s best inland sailing venues. There are over 600 ha of sailing water in a relatively safe environment with the Broad being shallow over almost its entire area. Directions to the Club car park and beach can be found here. The club has new changing facilities with hot showers and toilets. These were completed in 2008 and built by members. the latest news stories on the front page?